The Sunday Business Post has reported that Havok, the Dublin based games middleware company, has made a pre-tax profit of $176,413 last year, with revenues up 60 per cent to $5.1 million… read more here. 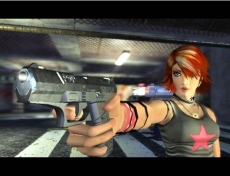 Havok software is used in the Xbox 360 titles Perfect Dark Zero (pictures, right), Amped 3, NBA Live 06, and Condemned: Criminal Origins. And in the multi-format Harry Potter and the Goblet of Fire, and James Bond from Russia with Love. State Engine, network play middleware software by the Dublin based company Demonware, is to be used in Activision’s ‘Call of Duty 2: Big Red One’ for PS2, Xbox, and GameCube. Late last week at Sony’s annual ‘PlayStation Meeting’ in Japan the company said they have entered into agreement with the Dublin based middleware provider Havok. The deal sees Sony gaining sublicensing rights for Havok’s physics and animation engines, with the middleware tools been incorporated in PlayStation 3 Software Development Kit. 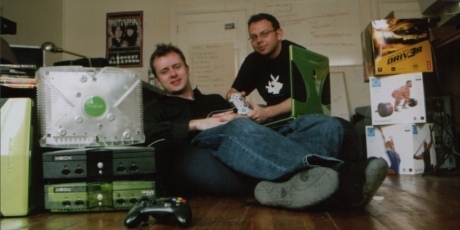 DemonWare founders, Sean Blanchfield, CTO, and Dylan Collins, CEO. Ireland-based tech website, SiliconRepublic.com, has published an article under the title 'Ireland can dominate games platform business'. The piece focuses on the words of Dylan Collins, CEO and co-founder of the Dublin games middleware company, DemonWare. “People don’t realise the job opportunities that exist in the games industry. Up until now the only games jobs were overseas. What’s happening now is there is an opportunity for people interested in the games industry to work at home in Ireland”, Collins told SiliconRepublic.com. DemonWare recently got approval from Sony, and Microsoft, to develop versions of their network-play middleware for the PS3, and Xbox 360, respectfully. Early this month, SiliconRepublic.com also ran a story on the rising numbers of collage and university courses for computer games development, a list of such courses can be found on GameDeveopers.ie. Multiplayer gaming - more players & pay-to-frag? The project nearest completion - set for an unveiling at the Game Developers Conference in March - is a middleware-product which will technical allow more players per game without upgrading server hardware. This will permit gamers to host larger games from their home broadband connections. demonWare are also working on a pay-to-frag system for first person shooters, early this week they ran a public test in a Dublin internet café. Volunteers were allocated Swiftcall call cards, which are been tested as an optional alternative to credit cards - “(it) examined how people behaved in a deathmatch situation where each frag won them 40c and each death cost them the same amount”, commented demonWare’s cofounder Dylan Collins, “Our volunteers were able to type in the PIN and top up their account to that value. The whole thing went reasonably well and we gained a lot of really useful information”. Collins, mindful of the problems when introducing money to gaming, stated “There's certainly huge potential there but you have to consider a lot of different aspects like balanced matchmaking, heating, payment, camping, different game types etc. even when you're only focusing on certain technical aspects of it. Saying that, we are very excited by it and see some very interesting opportunities opening up, particularly on the console front”.